We arrived in Rome via US Airways after only one stop in Charlotte from Huntsville. While in Rome, we used buses, taxis, and the subway. On the day we were planning to take a train, then a bus, then a taxi to our B and B in Positano, the guide we had hired to show us the major points of interest in Rome “just happened” to know of a driver who was bringing a group from Positano to Rome and was willing to make us a great deal to take us straight back from where he’d come to our destination. Serendipity!!! It was VERY relaxing to get on that van, eat gelato, and watch the scenery go by. In Positano, we did a lot of walking, rode the shuttle to the special restaurant (La Tagliata) I’ve told you about before, and then we found a driver willing to take us to the train station in Salerno to travel to Florence. Again, it was wonderful to put ourselves in someone else’s capable hands while we ooh-ed and ahh-ed our way along the incredible Amalfi Coast. 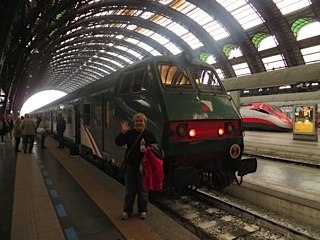 Trains in Italy are highly-organized, punctual, and efficient, and ONCE YOU LEARN THE SYSTEM, they are a great way to travel. Trenitalia is the largest and most popular line. The prices are very reasonable, and the routes are useful and relevant to tourists and to Italians. Paying by credit card? Go to the ticket window. Paying by cash? Use the Fast Ticket machines. Have a specific seat assignment? No need to have your ticket validated. Have an open-ended voucher good for a whole day? Be sure to validate your ticket at one of the machines near your train. They WILL check to be sure, and you will likely be charged AGAIN for your ticket if it is found to be unvalidated. The arrival and departure boards in the train station are very similar to what you find in airports. That is where you will see what track your train will be coming into and leaving from. It’s very important to be at the right place at the right time. Many stops are very short, so you have to be ready to board immediately. Trenitalia seats are generally arranged in a two-facing-two configuration. There is ample room for luggage, and the windows are large. There are bathrooms on board, but they are not on every car. Have you ever walked BETWEEN moving rail cars? “A girl’s gotta do what a girl’s gotta do.” Amen?? 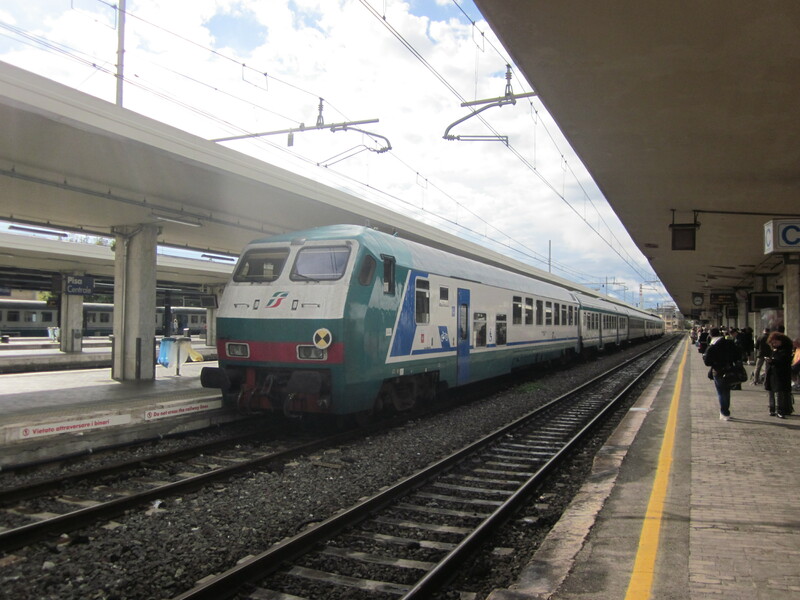 Italo is an up-and-coming rail line that we used on our trip between Florence and Milan. It was a little more expensive, but it was fast (at one point we were traveling at 300 kilometers per hour), the seats were nicer, and there was free wi-fi on board. Plus, they have a nice waiting area for their customers that lets you know which track to find about 15 minutes before your train arrives. The general population will likely still use Trenitalia, but Italo will definitely win its share of customers. 3) From Florence to Cinque Terre. Once there, a separate train was available that ran north and south between the 5 villages. 4) From Florence to Milan. 5) From Milan to Lake Como and back. 6) From Milan to Venice. Nathan Baggett is our nine-year-old grandson who lives with his parents and sister in Rome, Georgia. He has been fascinated with trains, train tracks, train whistles, train stations, and trolleys since he was just an infant. 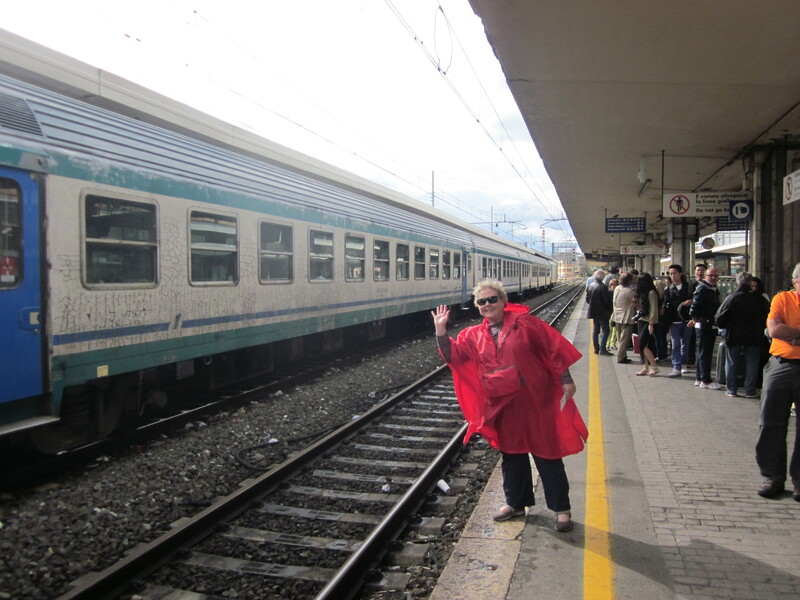 Every time we boarded a train in Italy, we wished for Nathan. He would have enjoyed the rides and the atmosphere so much. So, Nathan, these pictures are for you. We love you. Maybe one of these years, we’ll take you to Italy, and we’ll ride these trains together. 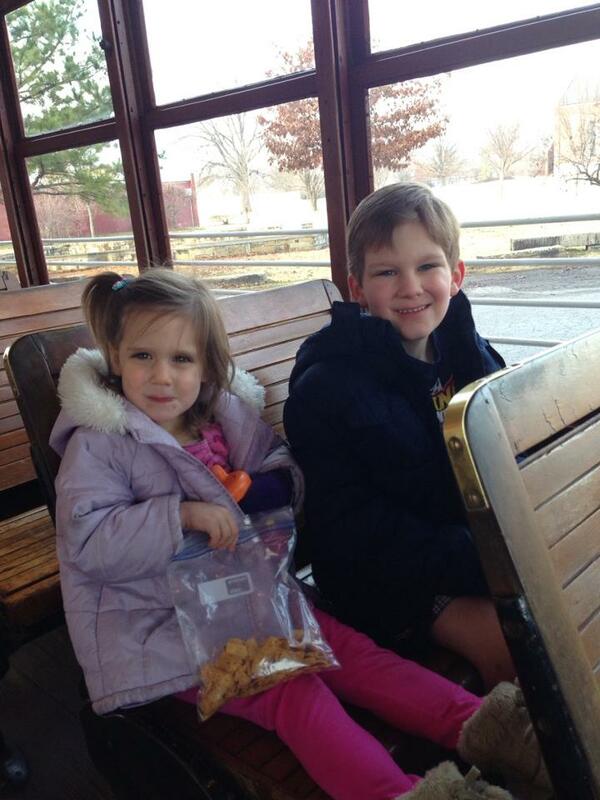 Nathan and Megan on a trolley. Grandmomma waving from Italy. 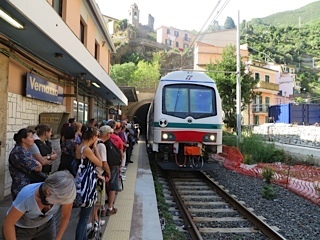 The train in Cinque Terre. 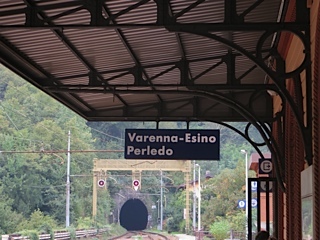 Notice the tunnel at the Lake Como station.